U.N. Secretary-General Antonio Guterres said that the presence of terrorist groups cannot be tolerated in Idlib. 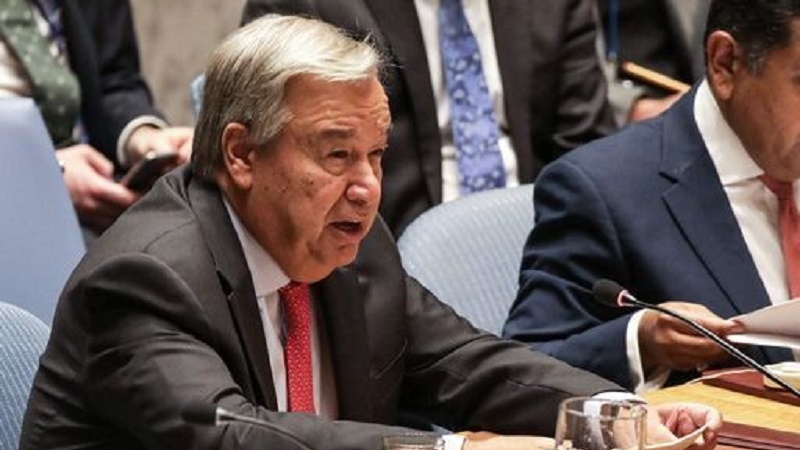 IranPress/America: U.N. Secretary-General Antonio Guterres said in twitter: "He understands that "the present situation in Idlib is not sustainable and the presence of terrorist groups cannot be tolerated." U.N. Secretary-General also asked all parties directly and indirectly involved in Syria to avoid a humanitarian nightmare in the last major terrorists stronghold in Idlib. Guterres warned that a full-scale battle in Idlib would unleash an unprecedented humanitarian nightmare in the province so all parties directly and indirectly involved in Syria should protect civilians and avoid a "bloodbath" in Idlib. The U.N. chief also asked Iran, Russia and Syria — the guarantor states in "Astana process" aimed at ending the violence in Syria — "find a way in which it is possible to isolate terrorist groups and ... create a situation in which civilians will not be the price paid to solve the problem in Idlib." In Sep. 04, Iran's deputy foreign minister for Political Affairs Abbas Araqchi said that Astana negotiations comprising the Islamic Republic of Iran, Turkey and Russia is making good progress in the fight against terrorism, and lessening of tensions. Terrorists have been merged with the civilians in the city of Idlib and use people as human shield, he said. Meanwhile, Russian Foreign Ministry Spokeswoman Maria Zakharova said in Aug. 30 that consequences of the West’s potential aggression against Syria will be inevitable and this will deal a heavy blow both to the settlement and global stability. More than 330,000 people have been killed in Syria and millions have been driven from their homes since the conflict began in March 2011, and the infrastructure of the country destroyed. In April 2017, thousands of Kefraya and al-Foua residents were bussed out to government-held areas in a swap that granted, in exchange, safe passage to hundreds of people living in two militant-held towns near Damascus, Madaya and Zabadani. About 1.2 million Syrian refugees have returned to their homes since September 2015.